It’s more than a month away and three of the prestigious St. Croix Food and Wine Experience events are sold out and 1,000 tickets for A Taste of St. Croix, the anchor event, will sell out over the next few weeks. To celebrate the 15th anniversary, organizers have enhanced some events and found a “restaurant fairy” to share some of the earnings with the restaurants who participate. 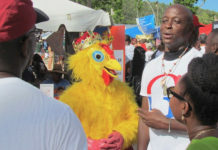 The first A Taste of St. Croix culinary festival, hosted by the St. Croix Foundation, was held in 2000 and since then the one-night extravaganza has grown into more than six events. Cuisine on the Green opens the Experience on Apr. 12 at Carambola Golf Course. Golfers and non-golfers can participate and sample tastings and beverages at stations throughout the Robert Trent Jones Jr. golf course. Tickets start at $50. On April 13, a new event was added at the Buccaneer Hotel – Icing on the Cake decorating class – with Duff Golden of the Food Network’s “Ace of Cake.” According to Katherine Pugliese, one of the event founders, the two-hour class will allow participants to interact one-on-one with the famous pastry chef. The cost is $95. Also April 13, an entertaining competition known as Food Fight between celebrity chefs Ralph Lampe, Sam Choy and Dean Spinks will start at 4:30 p.m. at Renaissance St. Croix Carambola Beach Resort and Spa. In the past, chefs have been challenged to swim to a boat, crack a conch and answer island trivia questions. Tickets are $75. A Taste of St. Croix begins Apr. 16 at 6 p.m. at the Divi Carina Bay Resort. Attendees will sample food and drinks from approximately 50 restaurants and wineries with live music. This year Pressure will perform. To participate and vie for bragging rights, restaurants are required to prepare food samples for 750 people and special selections for a panel of judges. Since most chefs showcase their best at A Taste of St. Croix, food, beverage, decorations and staffing costs can be $1,000 or more. “We’re trying to work through economic adversity, which is what St. Croix is all about. There is so much sadness with the struggles of the small businesses that are our foundation. We had attrition last year and there will be more this year,” Pugliese said. Tuesday she announced the organization will reimburse participating restaurants $500 this year. 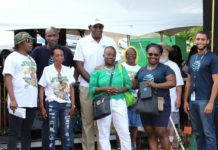 Restaurants will receive $200 when they register and another $250 when prizes are awarded at the end of A Taste of St. Croix. The “restaurant fairy” includes reallocated funds and donations from sponsors, she said. Also to help chefs and their businesses, the V.I. Agriculture Department will sponsor again a farmer’s market just before the events and donate $50 gift certificates help cover expenses and also promote locally grown fruit, vegetables, meat and dairy. In past years, there were as many as 55 restaurants that set up booths filled with gourmet food and drink. Last year there were less than 50 and organizers hope at least 50 enter the 2015 competition. 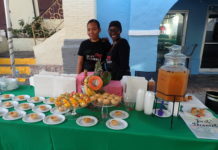 After the frenzy of A Taste of St. Croix and the “after party” sponsored by Moet and Chandon, foodies can rest a few hours before the next round of gourmet tastings. On Apr. 17, the Sunset BBQ on the Frederiksted Pier will feature food prepared by students from St. Croix Educational Complex’s Anton Doos and his culinary students. The students will be tutored by Ray Lampe, “Dr. BBQ,” Facebook Executive Chef Dean Spinks, former Facebook Chef William Desimone and Iron Chef Sam Choy. Participants will stroll the pier and sample food and drinks for $50/adults and $25 for children 12 and under. The event starts at 6 p.m. The last two events are Apr. 18 beginning with Kids Cooking at 10:30 a.m. at Pearl B. Larsen School. Local chefs Ashley McKinnon and Frank Robertson will make cooking fun for children 6-12 years old and accompanied by an adult. The cost is $25 per child. Each year, a variety of celebrity chefs travel to St. Croix to participate in the Food and Wine Experience. Along with those already mentioned, visiting chefs are Facebook Chefs Tony Castellucci and Dean Spinks; Restaurateur Todd Gray, recognized by the White House for participation in First Lady Michelle Obama’s “Chefs in Schools” program; Kevin Fazo of K Restaurant and Wine Bar in Orlando; and St. Croix’s Digby Stridiron. The team from Facebook participated for the first time in 2013 and after that created internships for St. Croix students at the corporate headquarters in California where they serve 55,000 meals a week. According to Pugliese, the students who interned have become permanent employees. The last event of the week is Wine in the Warehouse on Apr. 17 at Leeward Islands Warehouse. Featured with be wines to taste and purchase from winemakers, appetizers and live entertainment. A silent auction will benefit the St. Croix Foundation. Tickets are $100 each and the event starts at 6 p.m. The sold out events are the Gourmet Vintner Dinner at Tutto Bene Restaurant, the City Crawl at Café Christine, Rum Runners and Zion Modern Kitchen; and Just Dessert at Zion Modern Kitchen. The $1,000 a plate Cork and Fork Dinners in private homes are also sold out. The St. Croix Food and Wine Experience runs from Apr. 12 – 17. For more information, visit www.stxfoodandwine.com and www.tasteofstcroix.com.